EN Summary: In this article I am showing progress photos illustrating pages 1 through 7 of the pattern instructions; keep reading and, if blog content doesn't load, try disabling the ad-blocker and reloading the page. PT Sumário: Neste artigo mostro fotos dos passos de confeção desta jaqueta da página 1 à página 7 das instruções. Continuem a ler o artigo completo e, no caso do conteúdo não aparecer, experimentem desativar o ad-blocker e recarregar a página. EN: Life must go on and I pushed myself forward in spite of the enormous loss and pain I've been through. 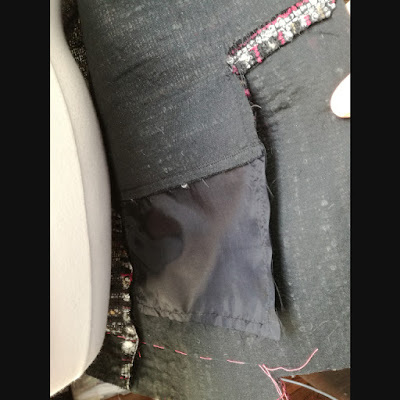 Sewing was what made us connect, it was the cement of our wonderful friendship... It's my happy place; all life setbacks go away and I focus solely on the pleasure of creating something beautiful. I know he felt the same way. 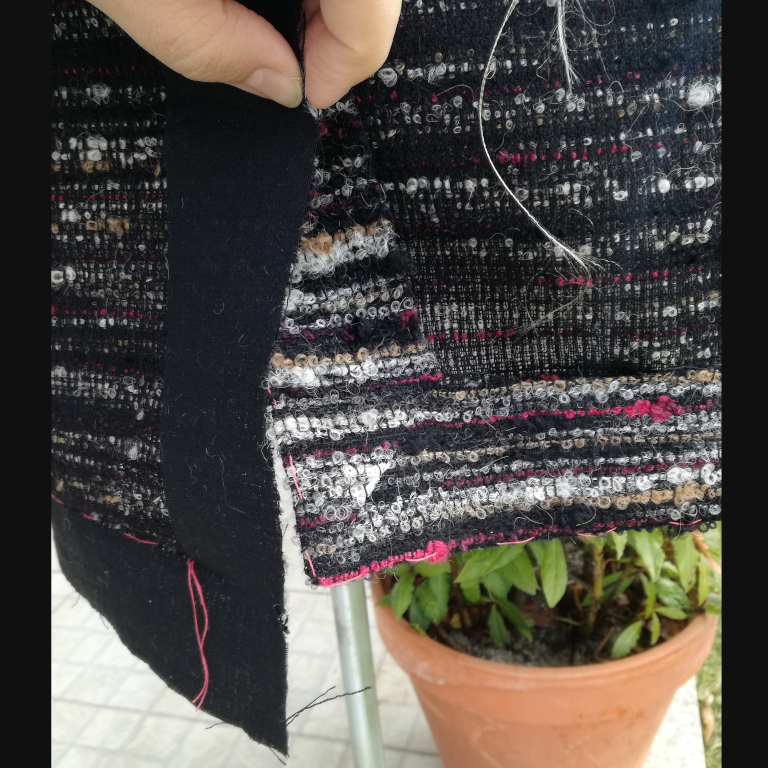 EN: Pay attention to the cutting layout; if you're making the tweed version and want the same effect of the model sample, the lower front should be cut on the cross-grain instead of the straight grain. I did everything according to the instructions, which only available in French in the kit; they are also available on DP Studio's website as a free download (here; click on the " + GAMME DE MONTAGE" link and download the pdf): the front (upper and lower pieces) was entirely reinforced with the fusible interfacing provided in the kit, along with the upper back and armholes, back hem and vent allowances (templates for cutting the interfacing are provided). 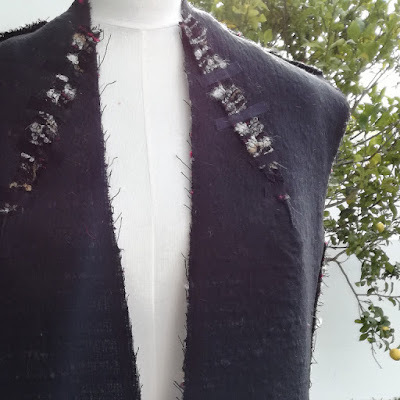 The front edge, neckline, armholes and shoulders were further stabilized with straight-grain fusible tape (also provided in the kit), on the front and back pieces. 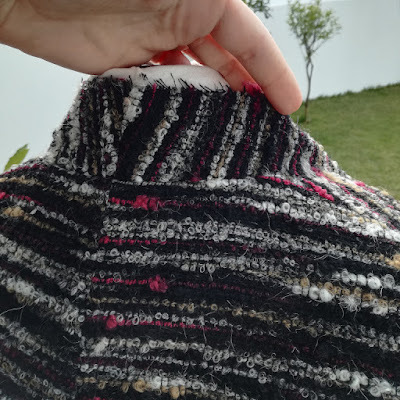 PT: Atenção ao plano de corte; se quiserem que a versão tweed fique como a proposta das fotos do modelo, é necessário cortar a parte inferior da frente atravessada e não no correr do fio. A confeção desta jaqueta foi feita de acordo com as instruções, apenas disponíveis em Francês no kit e no site DP Studio como pdf gratúito (aqui; cliquem no link + GAMME DE MONTAGE" e baixem o pdf): a frente (partes superior e inferior) é reforçada totalmente com entretela termo-colante (fornecida no kit) e as costas são reforçadas ao nível superior (decote e cavas), margens de bainha e da racha (são fornecidos templates no molde para cortar a entretela). Além disso, as orlas da frente, decote, ombros e cavas são também reforçados com fita termo-colante (fornecida no kit). 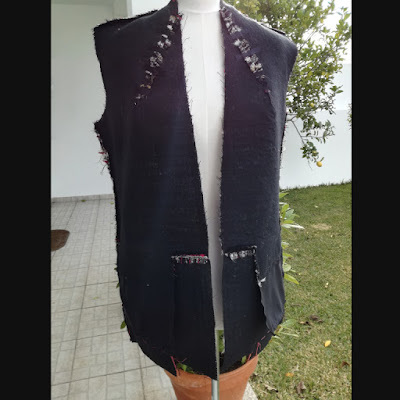 EN: The front pieces include the under-collar; the under-collar center back seam must be closed and pressed open before proceeding to construct the back of the jacket. The center back seam is stitched, stopping at the vent notch, and then pressed open; next the mitered corner on the left back (as worn) is sewn (all in page 6). PT: As frentes incluem também a parte de baixo da gola em pé; a costura central desta gola deve ser cosida e assente aberta antes de prosseguir para a confeção das costas. Nas costas fecha-se a costura central até a marca da abertura da racha e assenta-se a ferro a costura com as margens abertas. O canto inferior esquerdo (ao usar) das costas deve ser acabado em esquadria (tudo na página 6). EN: The next steps are sewing the inner shell (body lining and front facings/upper collar and stitch it to the body of the jacket along the front/collar edges; the bottom hem/facing/lining corner is also finished at this stage but the hem is left undone to be able to reach inside and stitch the sleeves to the jacket, and the lining sleeves to the inner shell. Next time I will share a few more details of the construction, before the final post showing all the details of the finished jacket. Thank you all for joining in and for the supportive comments in my last post and social networks. Paco will stay alive in our hearts forever. PT: Os passos seguintes serão a confeção da camada interior do corpo da jaqueta (forro do corpo e vistas com gola em pé incluída), para depois unir esta parte à camada exterior pelas orlas da frente e gola. 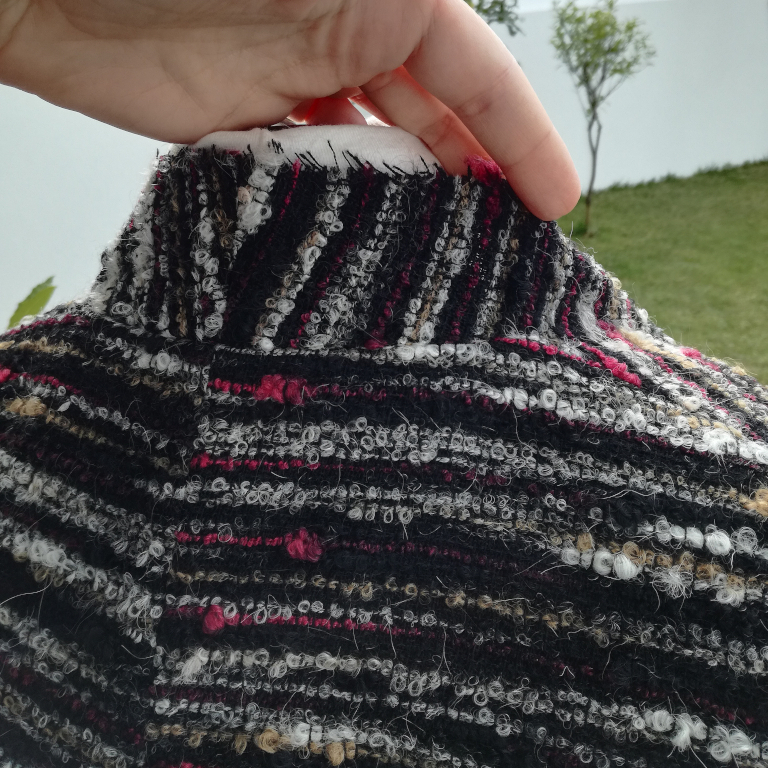 Nesta fase também é feito o acabamento do canto inferior da frente, que junta o forro com a bainha e a vista, mas a bainha ainda fica aberta para poder enfiar a mão entre a camada exterior e interior e coser as mangas em tecido ao corpo e as mangas em forro ao forro interior. 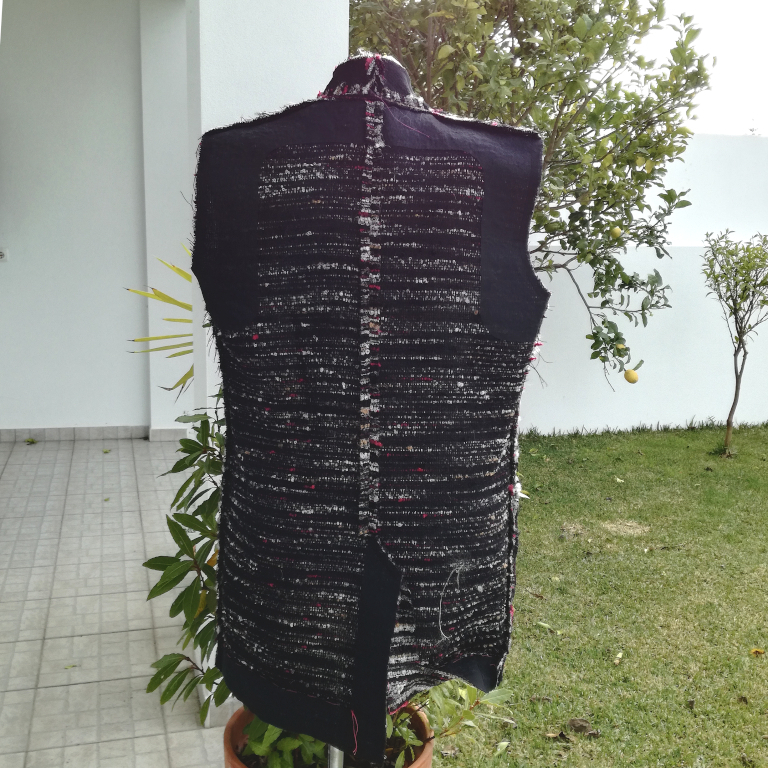 Da próxima vez partilharei mais detalhes da confeção, para depois mostrar todos os detalhes da jaqueta terminada. Obrigada a todos pelos comentários de ânimo e apoio no meu post anterior e nas redes sociais; o Paco vai estar sempre vivo nos nossos corações. NOTE: This sewing kit by is available at Hamon Couture Paris. Read more about the kit here. 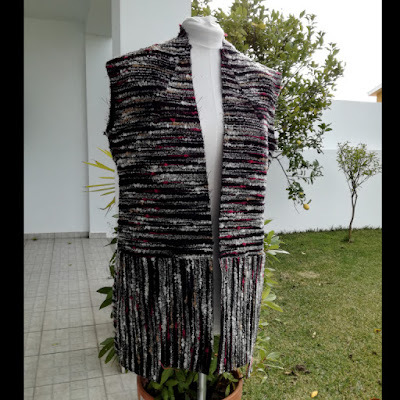 NOTA: Este kit de costura está disponível no website Hamon Couture Paris. Podem ler mais sobre o kit aqui. This is beautiful. Such a lovely fabric and the details are nice. 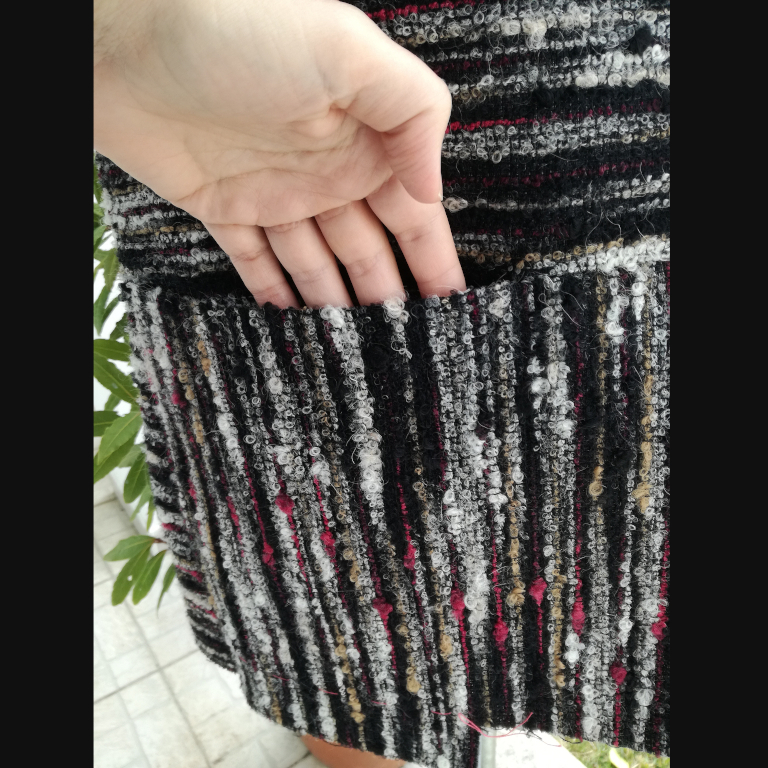 Neat looking pockets! I know you feel your loss so much, but by continuing to create outstanding garments & sharing them with others, you are continuing his legacy. Beautiful, exemplary work as always! I know you are feeling the loss so much. 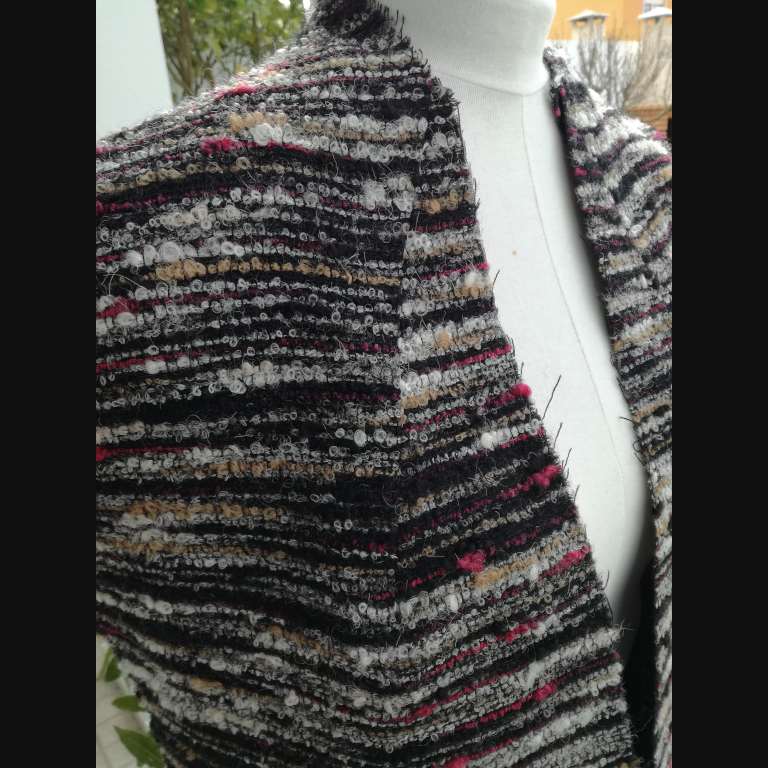 Continuing to create the beautiful garments you always make I hope will help you!